Leopold’s Ice Cream is growing our family … one jerk at a time! We are a unique, family-friendly, fast-casual restaurant in historic downtown Savannah committed to great food and exceptional customer service. We are a growing company looking to bring on people who are passionate about food and exceptional customer service. We believe in reinvesting in our employees … ensuring their success and happiness within our organization. As a Leopold’s team member, you will be an ambassador for our brand to both the public and your co-workers. You will be expected to welcome each guest warmly and with enthusiasm, deliver an exceptional experience, cheerfully interacting with all guests and inspire co-workers to be their best every day! 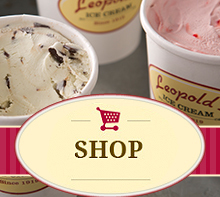 Our Delivery Driver will cheerfully represent Leopold’s Ice Cream to our wholesale customers and the general public; deliver our product in a safe, efficient manner and communicate all delivery issues and requests to Management! We offer a positive, fun work environment with a competitive salary, flexible schedule, ice cream discounts and performance-based advancement opportunities. Interest parties please email info@leopoldsicecream.com with Delivery Driver in the subject line. Being able to clearly communicating product knowledge and information to both our customers and our staff. Utilizing labor efficiently, always being mindful of costs and brand standards. Maintaining and contributing to a safe and respectful working environment for both staff and customers by using proper food handling skills and following workplace safety guidelines thereby reducing the risk of injury or accident. Opening and closing the shop according to all safety procedures. Creating and building a store culture that supports a positive work environment. Training staff on product creation as prescribed by brand standards. Training and coaching staff on guest services principles and practices as prescribed by brand standards. Identifying and delegating responsibilities to staff to ensure objectives are met and excellent service is consistently achieved. Providing coaching and feedback to staff and assessing their performance on an ongoing basis. Creating a positive guest experience by delivering a high level of service and ensuring all staff engage guests to understand their needs and exceed expectations. Soliciting guest feedback to understand the needs and wants of our customers. Making sure the business is clean and organized and assessing and delegating necessary cleaning and organizational tasks. Managing operations with passion, integrity and knowledge while promoting the culture and values of our business. Consistently monitoring product and waste costs to remain within goals. Developing and implementing creative solutions to areas of potential improvement. Following all company operating policies and procedures. Adhering to all cash management and handling standards. Supporting the actions and decisions of Management. Attend and assist in leading regularly scheduled staff meetings. A degree in business studies, management, hospitality management or hotel and catering preferred. Practical experience and business acumen are generally regarded as being equally as important as academic qualifications. At least 4 years experience working in a food establishment. At least 2 years of experience in high sales volume, fast casual environment. Computer and POS skills, including some Microsoft software. The ability to stand on your feet for 8 hours, lift up to 50 lbs., bend and reach. The ability to take direction and delegate responsibilities. The availability to work nights, weekends, and holidays. The ability to inspire and lead a team. Excellent interpersonal, organizational and problem-solving skills. To Apply: Applications must be completed in person. Applications are available daily between 9:30 & 11:00am @ 212 East Broughton Street. Be mindful that the application takes 30-45 minutes to complete. Please feel free to email info@leopoldsicecream.com with questions. Being able to clearly communicate product knowledge and information to our customers. Set-up and break-down of shop equipment according to all safety procedures. Creating a positive client/guest experience by delivering a high level of service and engaging guests to understand their needs and exceed expectations. Attend staff meetings once each month. To Apply: Applications must be completed in person. Applications are available daily between 9:30 & 11:00am @ 212 East Broughton Street. Be mindful that the application takes 30-45 minutes to complete. Set-up and break-down of catering equipment according to all safety procedures. Being able to be self-motivated, manage your own time and to work independently. The ability to work in a low-temperature environment. The ability to perform repetitive tasks. Maintaining and contributing to a safe and respectful working environment by using proper food handling skills and following workplace cleanliness and safety guidelines. Maintaining incredibly high standards of sanitation. Maintaining incredibly high standards of product quality. Set-up and break-down of manufacturing equipment according to all safety procedures. Managing ice cream pint inventory. …then we want your help to grow our company with a positive attitude and an uncompromising eye for quality and teamwork.